Final arrangements are being made for the National Best Quality Software Awards (NBQSA) 2009. This year NBQSA is organised for the 11th time and some of Sri Lanka’s best ICT products competed to receive the “NBQSA Seal of Excellence”. The NBQSA – Awards Ceremony and the Gala Dinner is scheduled to be held at the Warters Edge, Battaramulla, on 16th October 2009. There are a limited number of seats available to witness this grand event and Organising Committee has decided to provide these seats to Sri Lanka Section members for a highly subsidized rate. For reservations you may contact Harsha (Tel: +94112665261/2) at the BCS Secretariat. 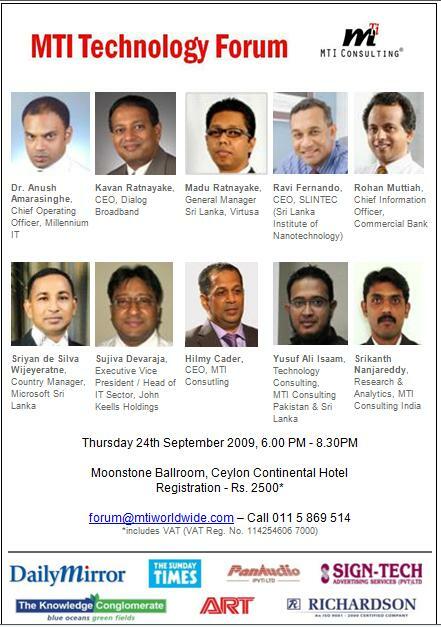 The speakers and panelists are: Dr. Anush Amarasinghe, Chief Operating Officer, Millennium IT, Madu Ratnayake, General Manager Sri Lanka, Virtusa, Ravi Fernando, CEO Sri Lanka Institute of Nano-Technology (SLINTEC), Rohan Muttiah, Chief Information Officer, Commercial Bank, Sriyan de Silva Wijeyeratne, Country Manager, Microsoft and Sujiva Devaraja, Executive Vice President / Head of IT Sector, JKH. The event is backed by research and MTI’s recent CxO survey on business technology in Sri Lanka and will be graced by key business and business technology leaders and will be an excellent networking opportunity for the attendees.